#VIXIndicator fired this at the close. Last one we got was on March 13th, and it was good for a 1.75% move up from that day’s close to intraday high 6 days later, before we stalled and pulled back a little. #VIXIndicator With a $VIX close at 13.54 or lower today, a”minor” upside warning will fire, reaffirming market’s upside bias in the absence of any significant pullback materializing. Should mean another leg higher next week. 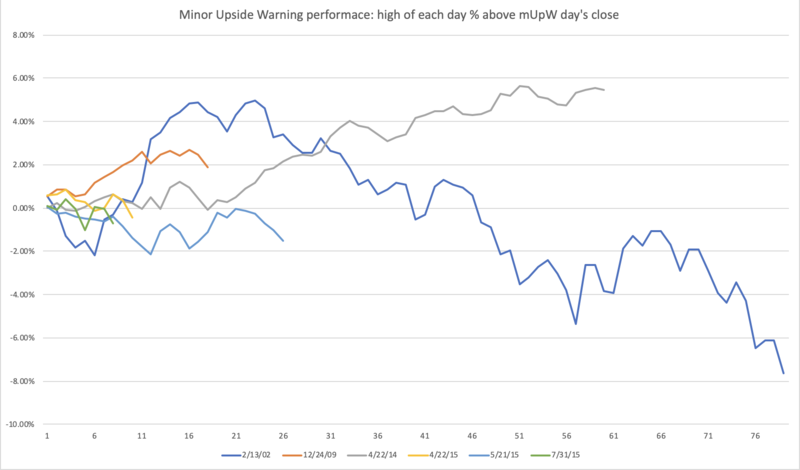 #VIXIndicator It was only a “minor” one so not surprising that it didn’t last long or go far… VIX spiked today to reach 25% higher than yesterday’s close, so that cancels the minor upside warning. A close at 17.04 or higher would be a Downside Warning. #VIXIndicator Usually the Upside Warning is canceled when we get a Downside Warning. But sometimes, like last Monday, the UpW is canceled by an intraday spike on the $VIX, with no DW taking effect. Usually when that happens, the DW comes within the next few days. But sometimes, the VIX retreats enough to fire a “minor” upside warning… which is measured on the Fib levels from the recent intraday spike. So three closes below the 78.6% line would fire this “minor” signal. That will happen today provided VIX closes below 14.44. This has happened only 6 times since 2000. Below is a chart with the performance of SPX in the days after each “mUpW”, ending at the next VIX spike or DW. You can see that it is mostly positive; even the longest one that goes negative spiked pretty high before rolling over. #VIXIndicator The $VIX just took out the Upside Warning by 1-point. We need to close at 16.97 or higher for this to be a Downside Warning. #VIXIndicator Since we’re in this pullback I looked back at other times we had a signficant pullback (more than 1%) after an Upside Warning fires. The chart below shows all of the instances since 1999. Two of them resulted in no new highs, and we dropped significantly before the Upside Warning was technically canceled (the two rows with red in the right-most column). The other times all eventually went higher after the dip. The center columns show the move 1-day, 2-days, etc, after the UpW. The right-hand columns show the number of days from the UpW to the new SPX high, and the percentage move to get there. Also note that other than one time last April, this hasn’t happened any other time since 2011. For me, the $VIX seems pretty unmoved by this week’s volatility and I still think we have higher to go before any major pullback.